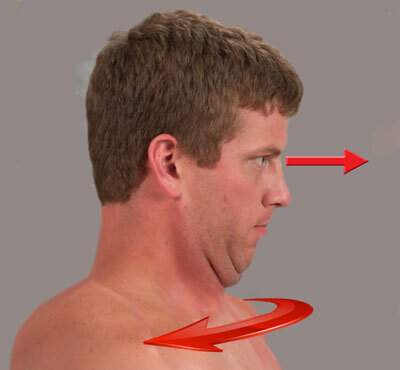 Luke was referred by his personal trainer for neck mobility issues resulting from a direct blow to his left shoulder during football practice six months earlier (Fig. 1 ). Although most of his cervical brachial plexus pain had subsided, he was still forced to turn his entire body to look into his rearview mirror while driving. Upon seated examination, Luke’s passive range into right cervical rotation, flexion, and extension was normal, yet he could only manage 30 degrees of left cervical rotation and sidebending. Fig. 1. 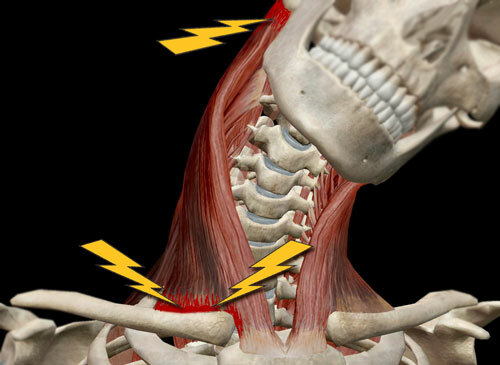 A side-to-side whiplash injury strain to muscles, nerves, and joints. To address the left rotation restriction using movement enhancers, my left hand slowly left rotated Luke’s head to the first (non-painful) restrictive barrier as my soft right fist resisted this effort creating a counterforce between the two hands (Fig 2). Luke was asked to take a deep breath and gently right rotate his head against my hand resistance to a count of 5 and relax. With my right fist still pinning the hypertonic upper traps, scalenes and splenius cervicis muscles, Luke was asked to look to over his left shoulder while actively left rotating his head against my (pin hand) resistance. This routine was repeated 3 times and then to help reassure his brain it could now move more safely, I removed my hands and Luke was instructed to turn his eyes and head left as far as comfortably possible. Fig. 2. To address the client’s left rotation restriction, my left hand slowly left rotates his head to the first restrictive barrier as my soft right fist resists. Client takes a deep breath and gently right rotates against my hand resistance to a count of 5 and relaxes. Client is asked to look to over his left shoulder while actively left rotating his head against my (pin hand) resistance (repeat 3 to 5 times and retest). This MAT maneuver helped regain some of Luke’s lost range of motion, but as I observed him actively left rotating, I noted visible reactive muscle guarding in his right SCM as he attempted end range. To address his SCM spasm using movement enhancers, Luke assumed a left sidelying position and I performed the graded exposure stretching technique (GEST) described in Figure 3. Following this routine, Luke was asked to sit and repeat the head rotation test, which showed that he was still restricted near end range. So, to determine if the brain was protectively guarding or there were additional nerve damage issues from his football trauma, I decided to try an assessment to trick Luke’s brain. Fig. 3. In this GEST, client lifts and slowly left rotates his head to the barrier while my soft fingertips grip right SCM muscle. Upon exhalation, he drops the right shoulder and slowly looks toward the table to a count of 5 and relaxes. He was asked to focus on an object directly in front and with chin tucked, slowly begin left and right rotating his shoulders Figure 4 As Luke’s shoulders reached the end range of right rotation, I asked him to stop and observe what his head and neck were doing. He was astonished when he realized how far left his head was turning and that he could accomplish this simply by right rotating his shoulders. I suggested he practice this brain-based self-care exercise at home while observing himself in the mirror. Fig. 4. Brain-based self-care exercise for cervical rotation restriction. Now that I knew that Luke’s brain was still protectively guarding that old injury, I began palpating up and down his cervical spine. As my fingers and thumb reached the base of the occiput, I noticed considerable right-sided suboccipital tone particularly in inferior oblique muscle on the right. Notice in Figure 5, how I use an optic-nerve (eye) enhancer to help relieve the suboccipital spasm that was preventing atlas on axis joint rotation. Fig.5.With client’s head and neck flexed 90 degrees, I left rotate his head to barrier. Using the optic nerve as an enhancer, the client’s eyes look right and I resist the accompanying right head rotation. The client then looks left and I follow this movement to relieve protective suboccipital guarding and increase range of motion at the atlas-axis joint. Repeat 3 to 5 times and retest. During the three weeks of Luke’s treatment, I experimented with many myoskeletal techniques and enhancers, but those described in this article proved to be the most effective. Luke’s commitment to his MAT enhancer homework was a big plus in his recovery, which shortened his time with me and got him back to the sport he loved.